The birth and parentage of Sai Baba are wrapped in mystery. Many authors and scholars conclude from various proofs that Baba was born at Pathri village in Parbhani District, Maharashtra State, India. Baba himself gave some hints about his life, which have been verified. He seems to have been born some time between 1820 and 1850 A.D. His parents were Brahmins. They handed him over to the care of a fakir, who in turn passed on the young child to a saintly person named Gopal Rao Deshmukh, an ardent worshipper of Lord Venkateswara of Tirupati. 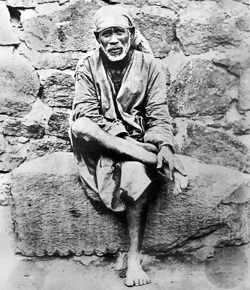 After ten years, his Guru directed him to move westward and after some wanderings, Sai Baba settled and spent the rest of his life at Shirdi. 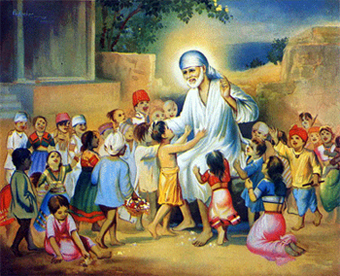 It is believed that Baba first came to Shirdi in 1854 and lived there for three years. He disappeared from there for sometime and returned to Shirdi with a marriage party in 1858 and lived there for sixty years till his Mahasamadhi in 1918 (Vijaya Dasami Day). He lived a simple life in a mosque. He never accumulated wealth. He advocated faith in God and tolerance towards all as the basic tenets for religious life. 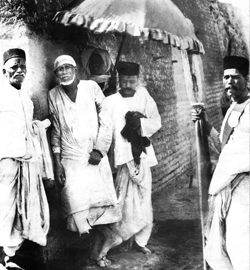 The early decades spent by Baba at Shirdi are not well documented. He was first living under a margosa tree, leading a simple life. Next, he moved to a mosque in the village, and resided there until the end of his life. Impact of the immortal teachings, Leelas (Divine experiences) and miracles of Sai Baba were greatly felt by numerous devotees who visited the place. 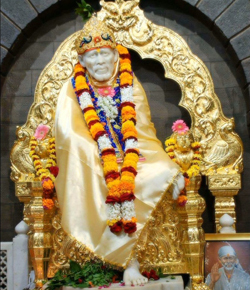 Thus, Shirdi has become the prime place of pilgrimage. To his devotees, Baba has come to stay as the embodiment of supreme spirit, primary cause of the Universe, pure consciousness and God incarnate. Few years before his Mahasamadhi, Baba said that even after his passing away, he would speak from the Samadhi (tomb). This assurance came out absolutely true, Baba seems to be more active now than when he was living. Amongst his qualities, the most notable was love - uniform, all embracing, intense love, showered on all and at all times, without any limit of sacrifice involved or any expectation - truly unconditional love at its highest. Baba was nothing but the embodiment of love. From the very beginning, he was always helping people, at first by dispensing medicines and later by dispensing ‘udhi’ (vibuthi) or ashes from the fire that he always kept burning by him. Udhi played an important part in the grace shown by Baba to people, and it is still being sought and used by devotees all over the world. But, as Baba explained, it is not the Udhi itself that works the wonder, but it is the devotees’ bhakti (faith and devotion), that leads to the good results produced by the udhi. The question is often asked whether Baba was a Hindu or Muslim. When we come to take an impartial view, we find, whether we are Hindus or Moslems, that this question is irrelevant or of very little importance. By birth, he was of Brahmin parents, and hence by a very large number of persons, he is considered to be a Brahmin. But as fate would have it, his Guru directed him to go westwards and Baba had to spend the rest of his life in a mosque, moving with all alike as an ativarnasrami, i.e., one beyond all caste rules. To those who considered him a Moslem, he responded as a Moslem and to those who cared to treat him as a Hindu, he responded as a Hindu and he expounded the Koran to the former and the Sastras to the latter. Whether Baba was a Hindu or a Moslem, he allowed every sect to keep to its own method of approaching God. To Hindus, he said: ‘Continue your Rama worship, and worship the stones which your forefathers worshipped’. He even presented some lingams, silver padukas, pictures and coins for worship by Hindus. To Moslems, he never gave any of these but allowed them to follow their nirakara (formless) form of worship as far as it is possible. So, the question of Sai Baba being a Hindu or Moslem is largely irrelevant because of his views and practice.